Erik Cork’s first business card simply read, “I Love To Write” almost 40 years ago. Nothing has changed, except that his knees now freeze him to the floor, so he does not soar incredibly high above the rim anymore like he once did when he was a wild & extra loud, free styling kid at Madison High in Houston Texas. He slammed basketballs with the greatest of ease, but avoided college studies and S.A.T.s. Young, artistic Erik matured, but suffered severe consequences as he endured being broke at an early age, barely earning the minimum wage. He had a young family to feed, so he picked up a pen. The End. Yes, Indeed! Erik was born in Indianapolis, Indiana and began his writing career as a traveling poet and an amateur actor touring on local Houston stages, as well as performing for numerous television & radio shows. He was thrilled and honored to be invited to read & recite his original poetry in local libraries and crowded churches. His life changed forever after meeting prolific Broadway playwright, Thomas Meloncon. Erik became more prominently known throughout the city as a contributing editor for Houston Style Magazine where famed publisher Francis Page, Jr. assigned him to write feature articles on living legends and national treasures he conducted face-to-face, full-length interviews with - such as Oprah Winfrey, Susan Taylor and Beyonce’. Mr. Cork wrote and directed the ground breaking Black History play, “Feeling Good About Me.” It was a five night student body extravaganza, noted for it’s gripping performances and celebratory content. He coordinated over 1,200 kindergarten - 5th grade students, teachers, parents, administrators and community members to perform on stage together in various ensemble casts for one amazing week in Missouri City, Texas almost three decades ago. The play was attended by over 5,000 neighbors and local leaders during its electrifying week-long run at the brand new auditorium named after NASA astronaut & pioneer scientist, Dr. Ronald McNair, on the campus of Willowridge High School. Mr. Cork rehearsed each class for two consecutive months and organized the entire production for free. He was honored as a Fort Bend ISD Community Volunteer of the Year, while simultaneously serving as the writing facilitator for the University of Houston’s dual BRIDGE and MESET (Minority Enrichment Summer Engineering Training) programs. Erik eventually evolved into the creator of the highly successful student literacy workshop formerly known as Rap, Rhythm & Rhyme: Rebuilding The Writing Foundation. Erik and his best friend, Joseph Williams, III, traveled throughout the nation signing autographs and presenting their musically motivating writing seminar to thousands of students, parents and professional educators. In 1983, Erik married Joseph’s lovely baby sister, Cynthia. They became co-founding partners of International Write Now, Inc., featuring the academically stimulating and educationally intoxicating Cork’s Coast-To-Coast Classroom Full-Day Student Writing Assembly Extravaganza. They are the parents of resilient professional educator Rebecca, enterprising Elijah and gifted Gabriel. Mr. Cork is the proud “G-Pop” (grandfather) to multi-media middle school megastar, JaylaMayla. He is a generous & unselfish mentor to multiple entrepreneurs across the country. Mr. Cork earned city-wide recognition as a well-respected writer-in-residence for the nationally-acclaimed Writers In The Schools organization. His reputation for working with young authors soon led him to other cities where was invited to facilitate student and staff writing seminars from coast-to-coast. Mr. Cork has taught on campuses located in the shadow of America’s most famous historical landmarks, including Mount Rushmore, Mount Hood, Mount Rainer, Maui, Honolulu’s Diamond Head, Disney World, the Empire State Building, The Statue of Liberty, Niagara Falls, Native American Reservations and hundreds of other diverse communities. He has also been invited to speak in foreign nations such as The Bahamas, Bermuda, Canada, The Caribbean Islands, England, Abu Dhabi, Ireland and Australia. Two of Mr. Cork’s most challenging audiences (to-date) include the day he taught over 200 seven-year old 2nd graders in Detroit for six consecutive hours. One peculiar little girl insisted on holding his hand throughout his entire presentation, so he knows she did not take any notes. The most spontaneous and unscheduled memory in Mr. Cork’s rich and diverse history as an educational consultant was a surprise presentation he conducted for the entire student body at a Chicago-area high school. Mr. Cork was told the day before that he would be presenting to 250 students in the lecture hall. The next morning, he was re-directed and escorted to a massive gym where more than 2,500 9th – 12th graders were waiting with clipboards and copies of his workbook that the kamikaze English department staff stayed up all night printing and binding without Mr. Cork’s permission. Everything worked out well, in spite of his heart that was racing over 100 mph. The students gave him a thunderous standing ovation at the conclusion of the workshop, then pleaded with their grade level principals to do it all over again the next day. That day will never arrive. Been There. Done That. Still have the t-shirt. Once Was Enough. Running up and jumping off tall bleachers filled with 2,500 screaming teenagers for 6 straight, non-stop, intense instructional hours is a once-in-a-lifetime accident. As if to test Mr. Cork’s resolve on this matter, the next year he received a call from the Kennedy Center in Washington, D.C. to conduct a similar session for over 3,000 elementary students in the surrounding DMV metro area. After careful consideration, Mr. Cork declined their tempting offer when he suddenly contemplated how a restroom break for 3,000 10 year olds could be carried out without forfeiting valuable chunks of his instructional time with the young DMV scholars. Mr. Cork is a teacher at heart who often makes counter intuitive business decisions based on what’s best for children. Mr. Cork once served as a guest faculty member for Harvard University’s Graduate School of Education Summer Principals’ Institute attended by some of America's premier principals. Other institutions of higher learning where Mr. Cork has showcased the dynamic strategies of his innovative writing workshop include Yale, San Francisco State, Rice, Texas Southern, Tuskegee, DePaul, LSU, St. Johns, Florida State, Baylor and the University of California-Riverside where he worked with PhD candidates and college freshmen. Professional educators who routinely reinforce and ardently practice the techniques and writing tips Mr. Cork has taught them show remarkable improvements, superb statistics and dazzling data to substantiate their claims of excellence and Language Arts superiority. Mr. Cork gives 100% of the credit to dynamic campus leaders and the thousands of classroom teachers he is honored to train. 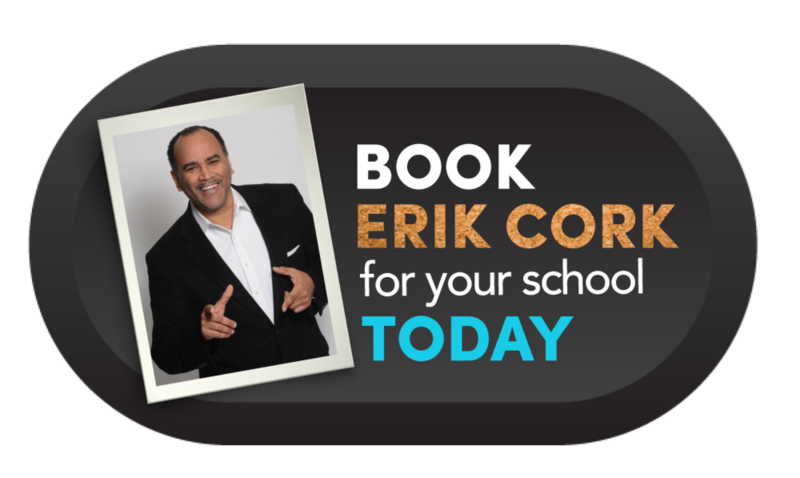 Mr. Cork has been a featured keynote speaker at major educational conferences where he passionately demonstrates a wealth of essential written communication skills. He has held the microphone at the National Association for Supervision and Curriculum Development (ASCD), the National Association for Elementary School Principals (NAESP), the National Alliance of Black School Educators (NABSE), the Texas Teachers of English to Speakers of Other Languages (TEX-TESOL), the Association of Compensatory Educators of Texas (ACET), the Virginia Elementary Principal’s Association (VEPA) and the Texas Middle School Association (TMSA). World-renowned Kimetologist and historian, Dr. Asa G. Hilliard, III, once passed his prestigious baton to Erik at the National Black Child Development Institute (NBCDI) in Washington, D.C.. Baba Asa & his longtime legendary colleague, the ridiculously effervescent Dr. Barbara Sizemore, joined forces to become two of Erik’s most beloved mentors. Mr. Cork served as a master teacher for education reform pioneer Bill Daggett’s New York-based International Center for Leadership in Education, which boasts one of the most brilliant educational conferences on planet earth – the incomparable Model Schools Conference. Erik was also affiliated with Texas Southern University's Center for Effective Pedagogy for African American Learners (CPAL), and is a frequent presenter with the Visionary Leaders Institute (VLI), founded by fiery Ako Kambon from Columbus, Ohio and presently based in Atlanta, Georgia. Mr. Cork was once appointed to serve on a National Musication Committee, organized by humanitarian and world peacemaker, Stevie Wonder. As a vocalist, Erik sang with the award-winning gospel group, Seraphim, founded by the late Hanq Neal. He has shared the stage with stellar gospel sensations Bishop Marvin Winans, Bishop Marvin Sapp, Take 6, Fred Hammond, John P. Key and notable others. Erik has played drums a couple of times (very poorly) for gospel music goddess and fellow Houstonian, Yolanda Adams. Other gospel artists he admires and listens to ardently include Donald Lawrence, The Walls Group, Jonathan McReynolds, Tamela Mann, Richard Smallwood, Kim Burrell, Mary Mary and Donnie McClurken. Erik’s mother, Margie, was the music minister, pianist, songwriter and praise leader for Grace Congregational Church before she joined the Heavenly choir. Elder Walter Turner, Jr. succeeded the legendary Bishop R.L. Finney, Sr. as servant leader and pastor of the Sabbath worshipping church where Erik grew up and continues to faithfully attend. Erik’s musical tastes expand beyond the genre of gospel music. In his wildest dreams, if he ever enjoys the pleasure of meeting vocalist extraordinaire Rachelle Ferrell, he will probably faint face first on the floor right on the spot. He is a lifetime super fan of The Manhattan Transfer, DeBarge, Mel Tourme, JB Craipeau, Natalie Cole, Frank Sinatra, Roger Troutman George Clinton and Bootsy Collins. Funk music played in Mr. Cork’s general vicinity will cause him to dance immediately. His favorite Hip-Hop artists and spoken word aficionados are KRS One, Black Thought, Living Legend Dr. Roz, Se7en The Poet and Dee 1 from New Orleans. His favorite authors are Richard Bach, Kahlil Gibran, Bishop T.D. Jakes, Dr. Asa G. Hilliard, Dr. Pedro Noguera, Susan Taylor, Dr. Michael Eric Dyson, Dr. Cornell West, Mychal Wynn, Dr. Boyce Watkins, Dr. Chike Akua, Vincent Taylor, Kobie Wilkerson and numerous others. Mr. Cork’s favorite motivational speakers are Tony Robbins, Les Brown, Bob Proctor, Eric Thomas, Evan Carmichael, Gary Vaynerchuk, Grant Cordone, Lisa Nichols, Principal Kafele, and Wayne Dyer. Erik is a devoted advocate for teachers and young scholars everywhere. Mr. Cork constantly contributes fresh ideas to institutions and individuals making accelerated academic impacts in the lives of those they have been called by the universe to uplift. Mr. Cork has the utmost respect for anyone who has dedicated their life to be true to their passion and to their noble purpose of being a blessing to others - regardless of their non-traditional qualifications or lack of college credentials. Mr. Cork is a cheerleader for big hearted people who immerse themselves in the refreshing rivers of reciprocation by pouring their time, talent, resources and energy into meaningful missions that propel, uplift and empower dreamers,…especially children. © 2018 International Write Now, Inc.